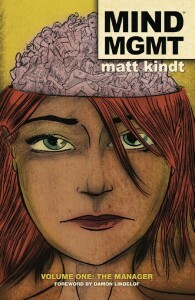 The most striking thing about Matt Kindt’s Mind MGMT is the art style, done with loose pen and watercolor sketches. It’s like nothing I’ve seen before in a graphic novel, and definitely gives the book a unique flavor. I will admit, however, that although the art is interesting, it isn’t entirely to my personal taste. I like that Kindt did something original with his style, but I had a hard time accepting the art as a stylistic choice instead of something that just felt a bit amateurish. A variant cover by Gilbert Hernandez included at the end of the book made me wish for a version of this story told using Hernandez’ clear, bold style instead. As for the book’s story, it focuses on an investigative journalist named Meru who is trying to write a follow-up to her bestselling first book after two years with no success and dwindling funds. When she hears a recap of a story about a strange “amnesia flight” where all the passengers lost – and never regained – their memories, Meru calls her agent and suggests it as the topic of her second book. Her agent is skeptical, but agrees to fund a trip to Mexico for Meru to investigate a possibly connected event and try to track down a missing member of the amnesia flight, a man named Henry Lyme. Throughout the book, an unnamed stranger dispassionately narrated Meru’s adventures, claiming she is following a series of “breadcrumbs” left behind to point her in the right direction. Everything Meru does seems pre-ordained, and she finds herself unable to escape ever-present feelings of déjà vu, or the CIA agents and unkillable couple who follow her every move. Each chapter of the book includes a case file on an individual with supernatural powers recruited by a mysterious agency called Mind Management. The more Meru uncovers, the more it becomes clear that Mind Management is the source of it all. All of this strangeness converges in a meeting between Meru and the man named Henry Lyme. Although the story is full of interesting concepts, it feels like the tone of the narration keeps everything at arm’s length. Character development is minimal, and the dialogue is all very one-note. Henry Lyme’s story is the most interesting part of the book, but in the end I didn’t get very invested because the characters felt like tools of the plot and not real human beings. This is the first volume of an ongoing series, but I’m not sure where the story might go from here; the book wraps up enough that this could serve as a standalone story. Overall, I thought the book was a decent enough read, but I don’t plan on reading further volumes of this series. When the heroine of The Rook wakes up, she finds herself standing in a park in the pouring rain, surrounded by dead bodies and with no memory of her life or the events that led her to her current predicament. Luckily, the former occupant of her body, one Myfawnwy (pronounced “Miffany”) Thomas, was both meticulous and forewarned, and so she prepared for every eventuality by leaving two letters in the coat our heroine is wearing. The first starts as follows: “The body you are wearing used to be mine.” Much of the novel unfolds as a one-sided conversation between the woman Myfawnwy used to be and the one she becomes after losing her memory. For simplicity’s sake, O’Malley refers to the latter as Myfawnwy and the former as Thomas. Thomas lays out two options for Myfawnwy to follow: she can either assume a fake identity and hide from whoever is trying to kill her, or she can work to fit herself back into the role and identity of her “predecessor” and try to solve the mystery of her attack. Naturally, she chooses the second option, or else the novel would have wrapped up very quickly. It turns out that Thomas is a high-level bureaucrat in a secret organization called the Checquy which devotes itself to controlling and covering up supernatural threats to the UK. She also has powers of her own, as do all upper-level members of the organization. Myfawnwy discovers those powers inadvertently when she is attacked a second time and uses them to knock out several more people at once. However, as she reads more into Thomas’ history, it becomes clear that she never quite lived up to her potential. Even though she could have been powerful, she preferred desk work to field work, and had a reputation for shyness. The conceit of an amnesiac main character is an excellent way of introducing readers to the strange world of the Checquy. Myfawnwy’s coworkers run the gamut from her fairly normal corporate secretary to an entity called Gestalt who controls four bodies with one mind. O’Malley populates this world with strange and occasionally horrible details that live in uncomfortable proximity to each other. Myfawnwy is also a fantastic character, frequently hilarious and always likable as she bullshits her way through departmental meetings and unexpected field work. The perspective bounces back and forth between Myfawnwy’s modern-day adventures and Thomas’ letters, which fill in backstory and handle a lot of the world-building. Myfawnwy is also surrounded by great characters in the present day, from her too-beautiful American counterpart who becomes a good friend, to the disgustingly unhinged villain who confronts her later in the book. 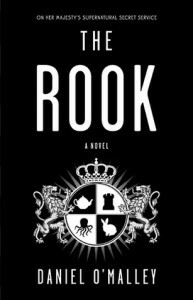 The Rook is commonly compared to a lot of other authors and books, but it’s definitely more than the sum of its influences. The best description I could come up with when summarizing the book for a friend was that it’s a bit like The Bourne Identity with Terry Pratchett’s sense of humor. if you’ve ever read anything by Tom Holt, I think his work is a fair comparison; he also enjoys mashing up mundane things like accounting with werewolves and vampires. The one criticism I would make of the book is that Thomas’ letters consist almost entirely of infodumps. It makes sense for the character, and O’Malley mostly gets away with it, but I do wish the balance leaned more towards Myfawnwy learning about her world through footwork rather than reading those letters. In any case, I loved the book, and am very excited that O’Malley plans on writing more books in the same universe. The Rook wraps of Myfawnwy’s story pretty neatly, so my guess is that future books might focus on other characters, but if he does choose to revisit this character at a later point in her life, I won’t complain.